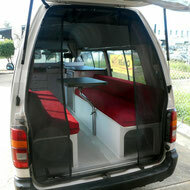 This layout is specially designed for the MWB Fiat Ducato current shape. 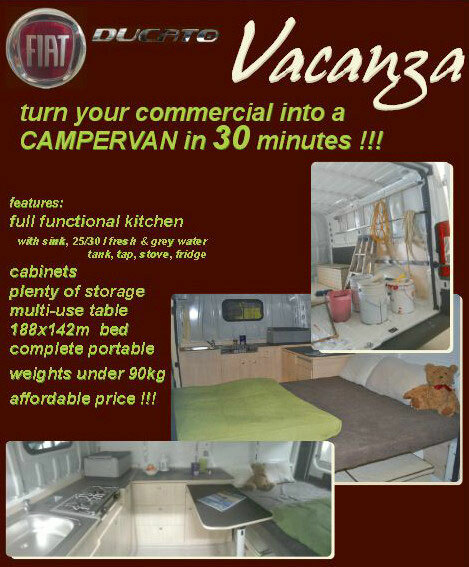 Every Ducato van can be converted into a weekend camper and back in under 30 minutes, thanks to our smart conversion kit! Check price list, available extra's & FAQ sheet- theVacanza: starting from $8.500 only ! Safe money: One van and you get the best out of both worlds - the 2 in 1 wonder! The most frequent questions will be answered here. From which fridges can be fit to how much the 3 piece convesion weighs.